My colleague Akhilesh Pillalamarri has written a controversial piece on the legacy of British colonialism in India (See: “Sorry, the United Kingdom Does Not Owe India Reparations Revisited”). In the article Akhilesh discusses a recent debate held by the Oxford Union on the motion “This house believes Britain owes reparations to her former colonies” in which Indian politician Shashi Tharoor laid out his arguments in support of the motion. The debate has touched a raw nerve and went viral in India after Shashi Tharoor made his arguments in support of the motion public on Twitter. 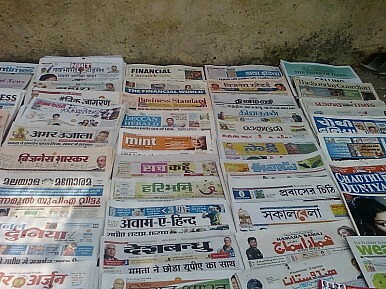 Paradoxically, however, the very fact that Indians can openly debate the pros and cons of the argument and voice their opinions online or in print (and in English) can be traced back to the legacy of British imperialism, since it was the despotic rulers of the British Raj that helped create India’s modern press. Of course, the press (which for most of the history of the British Raj was synonymous with newspapers) was never free from government interference and censorship during the British occupation of India. After all, the British Empire “was not liberal in the sense of being a plural, democratic society,” as Kwasi Kwarteng states in his book Ghosts of Empire:Britain’s Legacy in the Modern World. The empire openly repudiated ideas of human equality and put power and responsibility into the hands of a chosen elite, drawn from a tiny proportion of the population in Britain. The British Empire was not merely undemocratic; it was anti-democratic. Newspaper circulation in India, first introduced by the British in the 1790s, really took off in the 1860s due to the expansion of the rail network and an effective postal system. “By 1885 there were 319 vernacular titles with a total of circulation of 150,000 and 96 English language papers with a circulation of 59,000,” Lawrence James explains in his work Raj:The Making of British India. Pupil: Sir, in what relations do Englishmen stand to the people of India? Teacher: The same in which a tiger stands to a lamb…the Englishman broke the necks and drank the blood of immeasurable Indians. Interestingly, the press also had substantial liberties during wartime in 19th century India. During the numerous 19th century colonial conflicts in South Asia, for example the two Sikh Wars, reports of soldiers and officers often made it into papers in both Great Britain and India since “there was no censorship of press reports and correspondence,” according to Lawrence James. Thus readers in 19th century Calcutta or London often had a clearer picture of military engagements than would have been the case in the 21st century during the U.S.-led invasion of Iraq and the war in Afghanistan. Studying the history of the Indian press, it becomes clear that throughout the history of the British Raj, the British administrators oscillated between living up to their ideal of freedom of the press versus the need to uphold British dominance in India. Consequently, the British introduced a host of laws throughout their rule that tried to reign in and curtail the burgeoning media industry, while still letting them operate in one fashion or the other. These include the Press Act 1835, the Vernacular Press Act 1878, Newspapers (Incitement to Offenses) Act 1908, the Indian Press Act 1910, the Rowlatt Acts 1919, and the Princes Protection Act 1922 to name a few. Some administrators encouraged the development of the press, arguing that it might prove to be an auxiliary to good government. Others imposed stringent measures to control all printed matter. The contradictions between liberalism and authoritarianism, which the working of this imperial experiment exposed, tended to eventuate in acts of legislative and executive fiat on the grounds that press freedoms inevitably impacted on other institutions, and that, because the Raj was by its nature despotic, unrestricted freedom of the press was inherently incompatible with imperial governance. Thus, to answer the question posed in the headline of this article (with the natural caveat that the origins of the Indian press are much more of a complex subject than can be covered in a small article), it is fair to say that the British Raj and British administrators were indeed responsibility for establishing India’s press. However, it would be difficult to call it “free” in a modern sense throughout the 19th and 20th century, although there was remarkable leeway in what Indian and British journalists “could get away with” on occasion. Furthermore, by the very act of introducing papers to the subcontinent in the 18th century the British did a great service to Indian democracy and a disservice to imperialism.